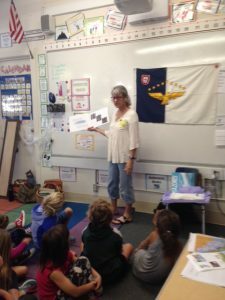 I recently visited an elementary school in Marin County – site where Maria and the Lost Calf took place…..
Margarida Da Silva and I visited three different second grade classes throughout the day, and shared stories from the past… as they are studying Immigration, Pioneers, and more. Margarida shared how she came to America and brought some lovely mementos, and the Azorean flag- the children enjoyed them all! I read part of my book, and Margarida read part in Portuguese, and the children were captivated! Grade 2 – 2.1: Students differentiate between things that happened long ago and things that happened yesterday. Grade Four – 4.2 Students describe social, political, cultural, and economic life and interactions among people of California, from the pre-Columbian societies to the Spanish mission and Mexican rancho periods. 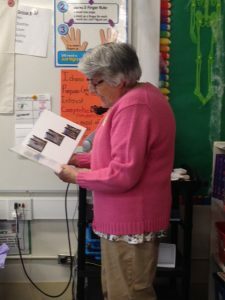 Please contact www.PortugueseBooks.Org for a school visit by the author of Maria and the Lost Calf, if you are interested, or would like to acquire copies for your classes, school libraries, book fairs or simply as a Christmas Holiday gift for the children in your family.